Land managers are faced with a conundrum when tasked with maintaining old-growth forest habitat and populations of the threatened Northern Spotted Owl (Strix occidentalis caurina) while reducing wildfire risk in dry, fire-prone forests of the inland northwest. One strategy is to continue the reserve-network strategy of the Northwest Forest Plan, in place since 1993. Another strategy proposed by the Northern Spotted Owl Recovery Plan (2010) and the Forest Restoration Strategy of the Okanogan-Wenatchee NF is to manage landscapes for forest restoration and spotted owl conservation without reserves. Our goal is to assess the compatibility of fuel treatments, wildfire risk, and conservation of Northern Spotted Owl populations in the eastern Cascades of Oregon and Washington. Our study focuses on fire and fuels management effects on Northern Spotted Owl habitat and populations, and considers the influence of the Barred Owl (Strix varia) on the Northern Spotted Owl. 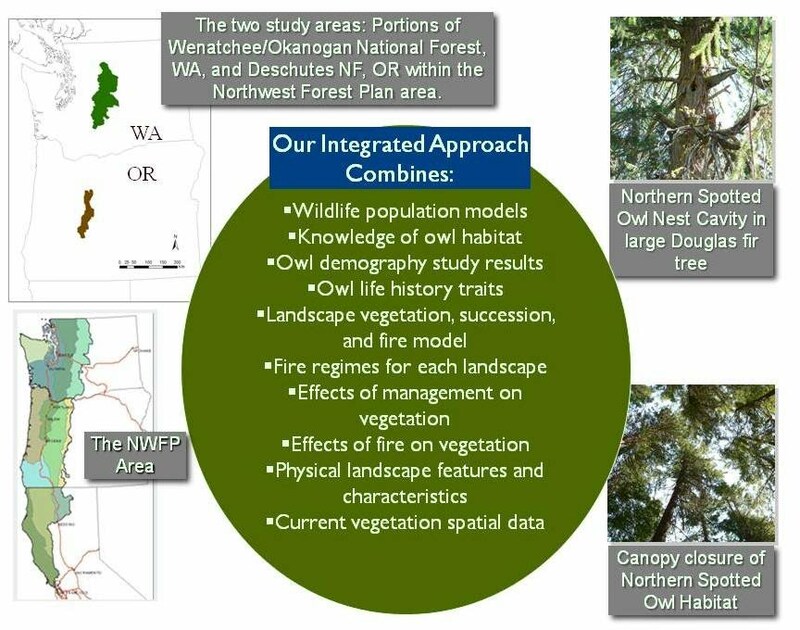 Our research is being conducted in the Deschutes National Forest, OR and Okanogan-Wenatchee National Forest, WA within the Northwest Forest Plan area. We are developing and evaluating several landscape management strategies intended to conserve Northern Spotted Owl habitat and reduce fire risk within each of these national forests. 1. Quantify and map current large wildfire risk to Northern Spotted Owl habitat and the spatial pattern of risk with respect to existing forest structure. 2. Determine short-term effects of management compatible with the Northwest Forest Plan and local forest plans. 3. Characterize long-term potential landscape dynamics and the distribution of Northern Spotted Owl habitat and populations under various restoration and conservation design scenarios for implementation by policymakers and managers. We take an integrated approach that tailors and uses several models, and incorporates knowledge of fire and vegetation dynamics at multiple scales, and northern spotted owl and barred owl habitat and population characteristics in these forests. Phase 1: Evaluate and spatially characterize current and potential future fire risks across study area landscapes, and project and evaluate the future forest vegetation conditions under several scenarios. Phase 2: Characterize resulting Northern Spotted Owl population dynamics including the effects of interactions with Barred Owls under a subset of landscape design and management scenarios.